Over the last couple of months, along with friends, Environs’ Dawn Landau has been sampling the restaurants at Ponce City Market (PCM). “Coming from the heart of Midtown, it takes me less than 20 minutes to walk via Ponce to PCM, and then I burn off some of those tasty calories afterwards when I walk back along the Beltline and through Piedmont Park (tracking my steps on my new fitbit!)”. Amanda, Environs’ web/social media person, says “Ponce City Market is New-York-esque in that it attracts a great diversity of people, has beautiful design features, amazing food choices all in one location, and some really fun shops”. Location: Pretty much in the middle – look for the column dressed as a dragon! This is one of our favorite places, having visited it several times to keep trying new flavors from their extensive menu. This Szechuan restaurant opened in September and (finally) has its liquor license (yay!). 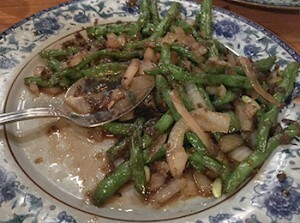 Each time we’ve been its been impossible to deny ourselves the dry-fried crunchy string beans, which come served in a delicious onion and spice sauce. Typically you want to order for the table as food tends to come out in a random order also because when it does arrive you find you want to try everything. Some of the dishes we’ve enjoyed: Dry Fried Shredded Chicken, Dry Fried Eggplant (made with mouth numbing Sichuan peppers – a very unique mouth feel and great fun to share), and the delicate but delicious Bamboo Fish (deep fried fish fillet – even our non-fishy friend enjoyed it), the Garden Duck (fresh, aromatic and a general crowd-pleaser). Watch out for the wobbly seats that also don’t leave much leg room though! Italian restaurant, closest to West Elm Dept. Store. We stopped in here before shoe shopping at Frye’s. It’s a cozy space and usually has a good crowd. 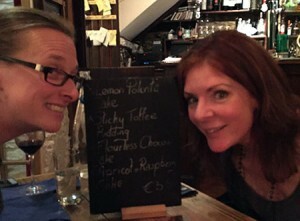 We sat at the bar and sampled some of the recommendations made by the bartender. We shared the arugula salad (crudo), and the meatballs (Polpette al sugo) and we left happy, members of the clean plate club and had a great all round experience. The bartender was super attentive and made a great wine recommendation. Bellina’s website. Next to Bellina, closer to West Elm. The bright lights put me off a bit in the beginning, for dinner, so I visited for lunch twice (maybe even three times but who’s counting?). The clam chowder is delish and is served with homemade “oyster” crackers that soak up loads of the thick broth. It makes for a PERFECT lunch on a cold day. Next up is dinner; a few other menu items since I keep ordering the chowder again and again! Fish Camp website. Next to Jia, in the middle area of the food hall. This is also one of our favorites. Having been here a few times, we’ve never been disappointed, good staff, great ambience and wicked good food. 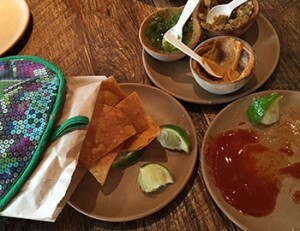 Get in, sit down and order the chips and guacamole (or round of 3 salsas – verde, benne, arbol). The chips are delicious, and if you’re a fan of Mexican street food, ask for some limes to accompany the table supply of Tapatio hot sauce and coat your chips good! Some of our favorites include: The Mula (had it twice and it did not disappoint) it’s kind of a crispy sandwich of tortillas filled with sweet potato and mushroom (it tastes amazing), the wedge salad (seriously!) 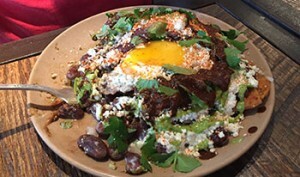 – it’s got some delicious flavors going on and the pasilla-buttermilk ranch dressing is perfection; and the Chilaquiles (pork, beans, chips, and lots more topped with a fried egg) – just as good for lunch the next day! They have 5 or so tacos ranging from $3.50 to $4.50 that are all worth a try. We loved the Al Pastor. “You just can’t go wrong here.” – Amanda. Minero’s website. Opposite end from Bellina, near Crate and Barrel. We ate here with our resident friend at PCM and respective spouses. This place was an instant hit; it has a lot of space so even when the building is full of people, the wait here is short. The Jw Kale Salad is possibly the best kale salad we’ve tasted: it’s crispy, crunchy and has a hot little bite somewhere in that flavorsome lemon vinaigrette. The winner on our table though was the charred octopus, which had our group all grappling for the last bite. Great restaurant, fun space and delicious food. Brezza’s website. Near the Crate and Barrel end of the food area. Full disclosure: our burger experience here was a hangover burger :). Two of us sat at the bar (with very decently priced wine) and shared the Cheeseburger with a round of their hand-cut twice fried fries and the plentiful salad. What we both liked is that they had made-from-scratch ketchup and mustard on the side, which were immensely flavorful and “moreish” (as Amanda’s mum likes to say about something you just can’t get enough of). The burger was cooked perfectly and melted in your mouth, the fries had just the right amount of crunch, and the salad, well, it was a salad, we’re not sure now why we ordered it; it’s a burger joint after all! H&F’s website. It’s not often you can walk through the Food court at PCM and just walk right up to the counter at Hop’s Chicken. We took our fried chicken up to our friend’s apartment and drank it with some fine wine (of course!). “The thigh was one of the juiciest pieces of chicken I’ve tasted with a perfect crunchy fried crust”. Our in-house PCM resident advised us that their $4 chicken biscuit is her favorite morning treat, with one of the fluffiest biscuits she’s tasted. Hop’s Chicken website.